This app allows you to easily create numbered list-based messages that can be sent to Facebook, Windows Live, Twitter, and LinkedIn. Just setup your starter text containing "#n". You can then post complete messages that automatically contain it along with a counter. A complete history of your posts is saved for easy resending. 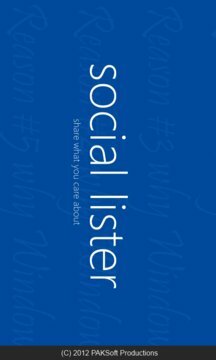 And Social Lister features full landscape support! Send out reasons why Mustangs are better than Camaros (or vice-versa)! Or why someone should vote for your favorite candidate. 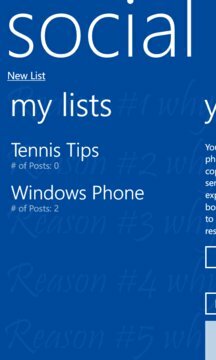 Or my favorite, why Windows Phone will rule the world! New in Version 1.7 - Setup keywords for each list that can easily added to posts.